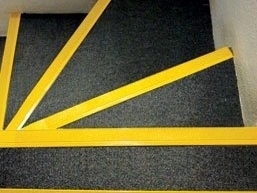 Car Park Lining supply and fit a full range of anti slip, non slip safety products for stair nosings, grating, decking, ladder rungs, stair covers, flooring, guarding, line markings, ramps, safety gates, safety rails, smoking shelters, containments trays and speed bumps. Many of our anti skid surface products are constructed from tough, durable GRP (fibreglass), a material that, worldwide, is acknowledged as a superior alternative to traditional materials such as timber and steel. 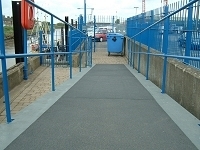 The silicon carbon grit incorporated in to most of the antislip product range not only enhances the product durability but offers excellent traction, even in the extreme weather and environment conditions. 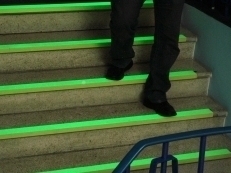 We recently laid some of our antislip surface range at some LUAS stations in Dublin. 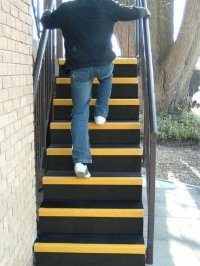 If you or your client have a problem with slipping then we have an antislip surface solution!